Congrats! You’ve done it! You started a blog, you’ve written some posts, and you’ve gotten the ball rolling. Now comes the hard part: maintaining the momentum. Don’t worry—we’ve got advice for veterans, too. 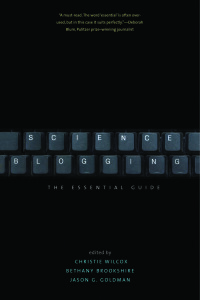 Below, we have included brief summaries of each chapter for established science bloggers, and a list of online resources that can help readers make their blog the best it can be. Blogging is a marathon, not a sprint. Unless you happen to launch a new blog under the umbrella of an established media brand, or you already have a substantial following online, you will probably spend a lot of time without many readers. When I started Not Exactly Rocket Science as an independent WordPress site, I had just a few hundred page views a day for at least eighteen months, or until I joined the ScienceBlogs network. That was a bit dispiriting, but it didn’t matter. I wanted to write. I had an itch that needed to be scratched. And the fact that some people were reading—regardless of how few they were—was valuable, rewarding, motivating. Small audiences matter; they’re a necessary stepping stone toward big audiences. And it takes time—months, maybe years, of effort—to build a big audience. There’s no way of shortcutting your path to greater traffic. As Science Bloggers, Who Are We Really Writing For? All blogging creates relationships with readers. Blogging about science means you’re also engaging (whether deeply or superficially) with a body of knowledge, a process for building that knowledge, and communities of practitioners engaged in that process. Arguably, this engagement imposes a kind of duty to be accountable to the world that this science is describing—to attend to the empirical facts and be honest about what is known for sure, what is probable, or what is possible. Not being accountable in this way means departing from the ethical commitments central to the scientific enterprise, a step that would put you dangerously close to the positions taken by purveyors of pseudoscience. Blogging about science may also make you responsible to scientific practitioners, since what you blog about can influence how the public understands what they do and who they are. By some measures, tweets with images in them get twice the amount of engagement as those without. Posts with pictures on Facebook get 53 percent more likes than posts without. Videos go viral far more frequently than long strings of text. The Crazy Nastyass Honey Badger video—a film I consider to be a totally legitimate form of science communication—has nearly 70 million views. People like pretty pictures, things they can click on, and stuff that bounces around in front of them. Just don’t make it autoplay, for the love of all things science. Tool Tales: Don’t Completely Write off Pinterest! Most people get into science communication because they love science. They want to change the way people think about scientists, educate them about scientific subjects, encourage them to become scientists, or get them involved in citizen science projects. Numbers alone won’t tell you if you’re achieving those sorts of goals. So while it’s good to keep track of the numbers, it’s important to come up with additional metrics that will help you determine whether you are accomplishing what you set out to do in the first place. Unconventional Metrics: How Can I Tell If My Blog Is Working? You need to get your ideas in front of as many interested people as possible, and more importantly, you want to get your ideas in front of us in such a way that we will read, remember, and respond to them. You need our attention, but our attention is an incredibly valuable resource. Consider the multitude of delicious (baking cookies), important (writing), or helpful (walking my dogs) things I could be doing at this moment. Reading your post comes with a price. If I choose to read it, I have chosen not to do all those alternatives. If I open up your post and start to read it, I’ve already made a calculation in your favor—I believe that what I’m about to read is going to be worth the opportunity cost. Maybe it’s because whatever I saw (a tweet, a Facebook post, perhaps simply the post title) piqued my interest. Maybe I’m basing my decision on my knowledge of other things you’ve written. Either way, your self-promotion is a promise to me, one of your potential readers, that your work will be worth my attention. Passion and investment are critical if you’re going to blog about controversies. You have to be consistent in your approach to the material and willing to alter your conclusions as new data come in. When you build trust in this way with the people who read your work, they will come to you for clarity when they read something somewhere else that leaves them scratching their heads. Responsibility and transparency also are paramount when controversy is your beat because even a hint of a conflict of interest or a failure to be intellectually honest about your material can torpedo trust. When bloggers think about how to moderate comments sections, they often instinctively try to set prescriptive norms: commenters should be respectful, you should use appropriate language, you cannot level personal insults at the author or at other commenters. Yet based on everything that we know about descriptive norms, it seems much more likely that the best way to encourage good behavior in a comments section is instead to model what good behavior looks like. A new blog post is functionally no different from a blank piece of paper. You’re free to create within the bounds of what the form can hold. And because blogs are media platforms, they do not require any specific style or type of content. These attributes give blogs a unique versatility, and make them useful testing grounds for other types of media. For science writers who want to compose a book, whether they’re veterans with a new project or prospective authors trying to sell their first title, blogs can be powerful tools throughout the publication process. So there you have it! Go forth and blog. Are you more of a novice blogger? Take a gander at the resources in our Science Blogging 101 section. And if you’re already up and running, make sure to check our the resources for how to find your voice.